Junior Research Fellowship (JRF) of CSIR/ UGC/ NBHM/ DBT/ ICAR/ ICMR/ ICPR or DST Inspire Fellowship. CPI/CGPA of 8.0 or more for B Tech from an IIT. Computer Science and Engineering: GATE score in CS/ EC/ EE/ MA/ PH if applicable. Applicant meeting the eligibility criteria may apply for admission to the PhD program under any of the following categories. Regular: An applicant who meets the eligibility criteria may apply for the admission to PhD program as a regular student. Such an applicant has to be a full-time scholar at IIT Bhilai and needs to be present on the campus for the duration of PhD program as per the rules of IIT Bhilai. A regular student receives Institute Fellowship as per the norms defined by MHRD. Sponsored PhD Programs: An applicant who meets the eligibility criteria may apply for admission to the PhD program under sponsored category if he/she is either awardee of research fellowship from some recognized funding agency (CSIR/ UGC/ NBHM/ DBT/ ICAR/ ICMR/ ICPR etc. or DST INSPIRE Fellowship) or is sponsored by his/her employer or is ready to self-sponsor himself/herself for the duration of PhD tenure. A certificate/declaration of sponsorship from the sponsoring body must be submitted by the applicant at the time of applying for admission. Sponsored candidate DOES NOT receive institute fellowship. Full-time: A sponsored applicant may apply for admission to PhD program as sponsored full-time student. Such a student needs to be present on the campus for the duration of PhD as per the rules of IIT Bhilai. 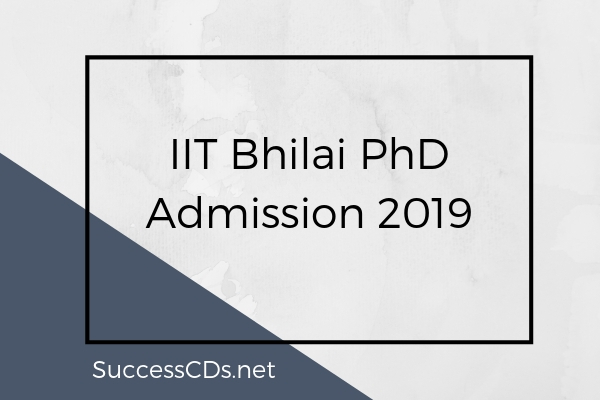 Part-time: Professionally employed personnel such as working engineers, scientists and teachers who can, while employed, attend regular classes as per schedule of IIT Bhilai may apply for admission to PhD program as sponsored part-time student. The applicant must be an employee of a recognized organization and be engaged in professional work in the area to which admission is sought. The student must be available in person for discussion/meeting with the supervisor on a regular basis. The applicant shall give an undertaking endorsed by the employer that the applicant will be relieved to attend all classes. External: An applicant working in industry / academic establishment / research laboratories having R&D facilities may apply for admission to PhD program as external applicant. Such a student is expected to carry out all/major part of the research work in the organization employing the student. The employer must explicitly undertake to relieve the applicant for staying on the campus to complete the required course work. A certificate to that effect from the sponsoring organization must be provided by the applicant at the time of applying for admission. The student will be under joint supervision of a supervisor from IIT Bhilai and one from his/her parent organization. The applicant shall provide the CV of the prospective supervisor who would supervise the applicant's work at his/her organization. Such applicants may apply as full-time or part-time scholar. External Full-time: An external full-time student needs to be involved in full-time research at the organization employing the student. External Part-time: An external part-time student may be involved in his/her regular job assignments along with the research for PhD.